Micro-Vu Non-contact Visual Inspection Devices: The main inspection tools for RT Dygert are our Micro-Vu measurement systems. These highly sophisticated, computerized machines are capable of automatically measuring parts against industry standards or customer supplied prints or drawings. 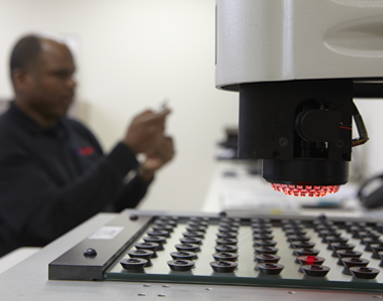 An advantage of the Micro-Vu over an optical comparator is that the Micro-Vu machine has the ability to take measurements in the Z-axis (vertically). This feature accommodates measurements of dimensions that would normally need to be taken on sectioned samples. Due to the 3D nature of the Micro-Vu measurement system, we have the capability of measuring distance, angle, radius, diameter, circularity, concentricity, flatness, parallelism, sphericity, true position, plus many more GD&T features. Shore A & M Durometers: Hardness is one of the most important physical properties of rubber materials. RT Dygert is equipped to measure incoming product on either Shore scale to help ensure that incoming parts meet customer hardness requirements. Normally, RT Dygert measures incoming product with the Shore A probe, however smaller parts may require durometer readings to be taken with the Shore M probe. Density: RT Dygert measures the specific gravity of incoming parts via the Archimedes method. This allows us to quickly verify the compound type, since most common elastomers have a wide enough density range to permit identification using the specific gravity method. Please note that RT Dygert maintains detailed calibration records on all our inspection equipment. In addition, all QC equipment calibration service providers are ISO/IEC 17025 certified.